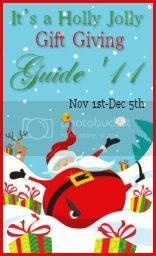 One of my favorite bloggy buddies has created her ownstorefront- creating some lovely, one of a kind, handmade jewelry. Not only is the jewelry fun, funky, and unique, but it also celebrates things that Grace herself holds dear- green and natural living, inspiring others, and creativity. The Blessed Elements storefront has a wide selection of options- from sculpted clay, to macrame, Chokers, Fused Glass Jewelry Sets, Bohemian Pins and more-the unique jewelry created by Grace adds a touch of fun and flair to any outfit- I love my "Green Man" for casual days, and it always gets plenty of smiles and questions. Every time I wear it, I am asked where I got it, and if it was handmade. I should carry Blessed Elements business cards on those days, haha! The items in the store are crated with love and care, and Grace is an ethical person and businesswoman, striving to give you excellent customer care and service, fantastic product, and a reasonable price that can be afforded in this economy. There is no point creating jewelry that you just love but can't afford, and in that vein there is also no added shipping costs for any purchased jewelry. Each piece has been created, crafted, sculpted, and etc from an original artwork by Grace. 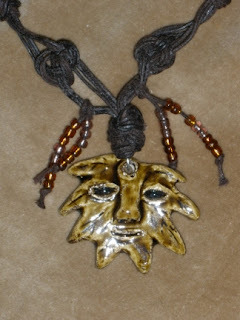 About my necklace- the pendant is hand sculpted and is a one of a kind original piece by Grace, and signed. It was kiln fired then glazed with a non lead glaze and fired again in the kiln. The necklace is hand macrame using traditional macrame knots with two tone rayon material. The accent beads are sculpted by hand and fired in the kiln and fired again with a clear glaze. 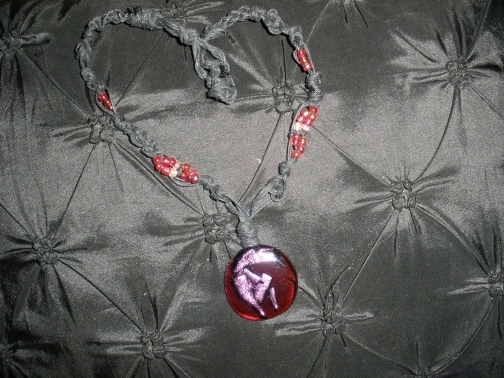 The prize is appx 16 inches long with red glass and pink accent glass infused in the center. 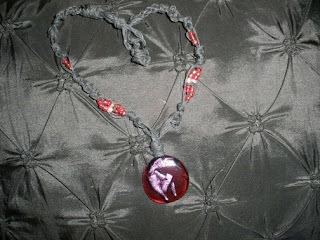 It hangs from a black macrame cotton cord with pink glass beads intertwined int he macrame knots. The necklace is signed by Grace with an engraved name tag. Thank you to Have Sippy, Will Travel for sharing this review, as well, Blessed Elements for sharing their work. Thanks for the nice giveaway. I do a little beading and this is time consuming work. I was also hacked into at my last rj_angel_house address and I just got back on the site after 8 days with no e-mails of course. What a nightmare. I think I am going to use my new mail at rjspratlen as my address to enter the blog giveaways. I have been going crazy!!!! Ha! Ha! Thanks for a great giveaway! I am loving all the nice jewelry! Very nice! I don't like how jewelery looks on me but it looks great on everybody else!